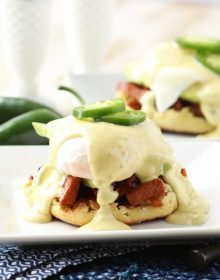 Kicked up with southwestern spice, this easy Eggs Benedict is topped with jalapeno hollandaise sauce. In a medium skillet over medium-high heat, saute the sausage and onion for 4-5 minutes or until the onion has softened and caramelized. Stir in the garlic. Cook for 1 minute longer. Remove from heat and set aside. Bring about 2 inches of water to a boil in a medium sauce pan and immediately turn it down to a simmer. Stir in the vinegar. Crack one egg in a small ramekin and then slowly tip the egg into the water. Gently swirl the egg to wrap the white around it. Repeat with the remaining egg. When the eggs are firm but not cooked all the way through, remove the eggs from the water using a slotted spoon and transfer to a plate. Cover with foil to keep warm. While the eggs cook, make the hollandaise by adding the yolks, water, lemon and salt to a blender. Blend the ingredients until smooth and then slowly add the butter in a thin stream until an emulsion forms. Add the jalapeños and blend until almost smooth. Set aside. Toast the english muffin and place each half on a separate plate. Top the english muffin with half the chorizo mixture. Top the chorizo with half the sliced avocado and one egg. Spoon half the hollandaise over the egg. Repeat with the remaining ingredients. Serve immediately.